Visualize in your mind that you have wooden building blocks, whose parts are regular quadrilateral pyramids. It is known that the height of the modular pyramids is two times smaller than the length of their base edge. Now mentally use individual pyramids to construct an unlimited number of the same cubes, which we call building blocks. Consequently, use your building blocks to build a cube C in the size of 4 × 4 × 4 building blocks and answer the following questions: a. How many building blocks and modular pyramids do you need to build cube C? b. 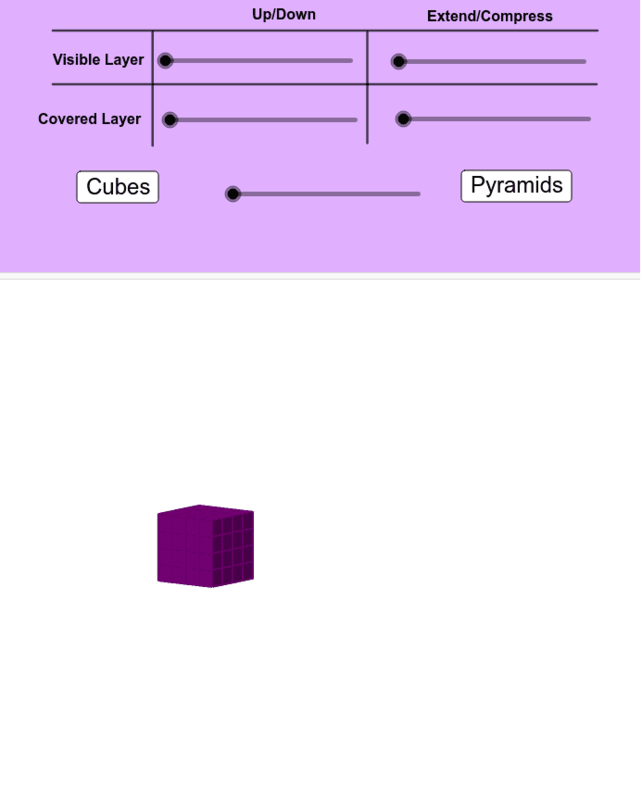 How many building blocks and modular pyramids are hidden in cube C that cannot be seen at all? c. How many building blocks and modular pyramids are in cube C that have visible two or three faces? d. How many building blocks and modular pyramids are in cube C that have three or four hidden faces? e. Take building blocks that have just five touch faces with the remaining blocks. How many building blocks and modular pyramids remain in cube C? Use the following GeoGebra Applet to solve the problem or check your solution.